The D+D Oberlauda UltraLight Bike Mirror is an extra-wide, lightweight mirror that offers plenty of visibility. Weighing in at a mere 58 grams, it attaches to virtually any handlebar or even your fork. The pivoting design is durable and easy to adjust. Light weight, great field of view. Use this on all of my bicycles. Worth the purchase! Superb clarity and the ability to see even small animals and chidlren, very adjustable. The connection between the mirror and the stem that holds the mirror and allows it to pivot needs improvement. When traveling downhill at speed, when you hit a bump in the road, the mirror pops off the stem and falls to the ground. I have had two mirrors scratched up in this manner. I ended up getting the position that I need and glueing the mirror in place. The situation I described occurred in Maine during the recent Bike Maine and I was able to get replacements quickly. I live in Florida and have had no problems. Finally- the Perfect Mirror for Bikes with Drop Bars! I have tried a lot of bike mirrors over the years and this one is the best, especially if you have drop bars. The easy to install mirror has a strong nylon/plastic strap that lets you mount the mirror right at the spot where the brifter hoods meet the bars, so the mirror doesn't interfere with your hand positions. Moreover, the mirror has excellent optics- it is not extreme wide angle like some mirrors (which makes it difficult to see cars that are more than 50 feet behind you), but is slightly wide angle and gives you good visibility to see any traffic that's closing in toward you. I have this mirror on both my bikes and am very pleased with it in every respect! All the other ones jiggle loose as you ride- this one stays put. A bit large and a bit heavy but I think that's what you need to get the job done. It works- buy it! It's a large mirror that can fold in and adjust in many angles. I was looking for a mirror that would stay adjusted and would clamp to my wife's touring style (Novarra Safari like) handle bars. It does just what we need. If I need to install a mirror on another bike where a Mirrycycle bar-end mirror won't work, I'll definitly go for another of these. Seeing behind adds another dimension and more safety to biking. This is my first mirror and I love it. It is very light weight so it does not vibrate while riding. Only problem I had was it moves out of adjustment because the surface that clamps on the handlebars is very smooth so it spins. My solution was to put a small piece of fine sandpaper between the clamp and handlebar. No more slipping. There is also a You tube video with mounting suggestions. Bought a second one for my wife. Sharp, clear view from distance to close up, you know what's coming! I use two of these mirrors, one on each side of bike handle bars so at a quick glance I know what's coming up or going on behind me. I mounted the right one on the bar and the left one on the hand grip so I could see right behind me. I can see a car approaching on my left from nearly a mile away, when they have the headlights on, so I feel secure in the bicycle lane. I tried them above the bar but they work much better below the bar. Best set of mirrors I have had! I have this on my commuter bike & now purchasing another for my road bike. 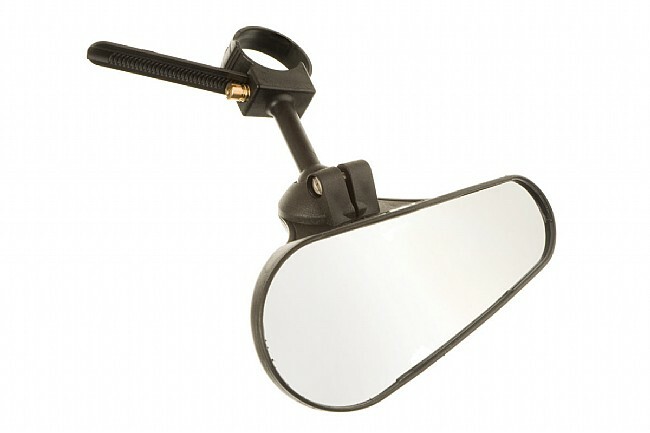 Do some googling, a lot of people rate this as the best light weight bike mirror available. This is the cheapest price I have found it anywhere. Thanks WB! Probably the best mirror for a recumbent I have used. Best mirror I've ever had, great view. I got tired of the cheap, too little mirrors that always needed adjusting or too easily broke. This one solves those problems. Has good visibility from different angles. Not quite perfect because it's mounted on the handle bar and thus there is a little bit of incovenience reaching around it on a road bike. But balanced out by always being in position and being able to be knocked around. To be useful, the mirror must be placed below the left grip (I placed the clamp just to the inside of the grip). The view it provides is helpful, but is very small and the wide-angle surface, of course, means very little detail can be seen, if any object is seen, you must presume it's a car approaching. So, I'm glad to have it, it looks much better than a large and heavy mirror on top of the handlebar, but the view to the rear is limited and mine needs to be readjusted periodically where it swivels. best mirror anywhere for drop handlebars. I love this mirror, the best on the market for drop handlebars. I wish it came with a longer stem and a larger mirror size. The shape of the mirror is genius. Light weight, simple design better for touring that a pure road bike. Maybe it is because I am tall and quite a distance from the mirror but it's size limits it's usefulness. Who knows there may not be a perfect solution on a bike. I have bar end shifters so can't try a bar end mirror. I've tried a lot of mirrors and this one is the best. It has a large viewing range and it's lightweight. Not much more to say. It works. Tried a couple of different mirrors. One gave me a perfect view of my reciprocating knee. The other made me dizzy the way it jumped around. This mirror Perfection! It's just like looking in my car's side view mirror. And it stays in place. I haven't been over rough terrain, so I can't comment about that. I believe in bike mirrors but I do not like the helmet or glasses mounted type. This mirror works great, it is adjustable, it is clear and easy to see traffic and just is what a good mirror should be. Great idea, can attach many ways to a bicycle, But the mirror distorts the images making is dangerous. Images seem further back than there are.